Max Chase, FBI special agent, is sent to witness a murder. He’s not to stop it, merely to film it so they have leverage on the killer. With his target’s skills, the FBI is far more interested in wielding him as a weapon in their employ than imprisoning him. But the setup goes all wrong. The elite assassin is himself murdered by not one but five assailants. 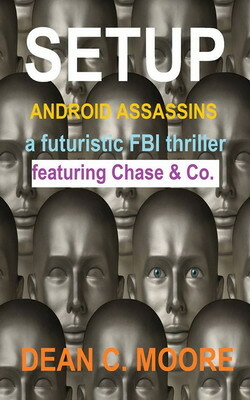 When those attackers turn out to be androids, who turn towards Chase and smile when the murder’s done, Chase is marked as the mastermind behind the crime. Now he’s on the run for his life, the most wanted man in America, not just to the FBI but to every intelligence agency in the country. And once his face is sprawled all over the media, there isn’t a cop or a fireman or a Good Samaritan who isn’t looking to turn him in. Because, you see, the real mastermind behind the killing spree is going after America’s heroes, the people fighting for truth, justice, and the American way, or at least what’s left of it that hasn’t been entirely engulfed by corporate-sponsored greed. For Max it’s all a game. Literally. Because this is his initiation into the FBI-FD, the Futurist Division of the FBI. Tasked with keeping those wielding breakthrough technologies from causing an apocalypse, or the next closest thing, the department is on a tight budget, understaffed and overworked. Their solution: the Setup. If Max can survive the frame AND bring in the actual mastermind without being killed under the ever-watchful eye of an angry nation, he can pick up his FBI-FD badge. Until then he won’t get one iota of help from the department. They won’t even acknowledge that he exists. And that last part is definitely a problem, being that his wife and twelve year old boy are caught up in the dragnet.